Nitra is a city in western Slovakia, situated at the foot of Zobor Mountain in the valley of the river Nitra. Kick off your visit on the 6th (Tue): take in the architecture and atmosphere at Church of St. Michael the Archangel, browse the collection at Chateau Appony, then make a trip to Malá synagóga - Gallery, then take in the architecture and atmosphere at St. John the Baptist Cathedral, and finally enjoy breathtaking views from City Tower. 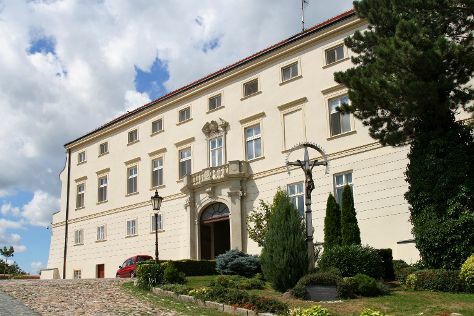 Keep things going the next day: test your team's savvy at popular escape rooms, see the interesting displays at Diecezne Muzeum, then explore the historical opulence of Nitra Castle, and finally tour the pleasant surroundings at Park na Sihoti. To find other places to visit, more things to do, where to stay, and other tourist information, refer to the Nitra travel guide. Use the Route module to find suitable travel options from Issaquah, USA to Nitra. Due to the time zone difference, you'll lose 9 hours traveling from Issaquah to Nitra. In September, plan for daily highs up to 70°F, and evening lows to 52°F. Finish up your sightseeing early on the 7th (Wed) so you can travel back home.